This year at Thanksgiving there were so many wonderful things in my life to be thankful for. Though Canadian Thanksgiving has come and gone, mindfully practicing thankfulness all year long has really become a priority in my life. First and foremost, I am grateful for the health of my family. I’ve known of so many people that have had an unbelievably rough year, losing loved ones or being diagnosed with illness. It really brings even the small things into perspective for me. Our house has not been without struggles this past year, dealing with my daughter’s eating disorder was a priority, as any mother will tell you that the health and well being of her children is the most important thing in her life. I’m so happy and proud of her recovery efforts; while she is still mindful of what she eats, she has been very successful in remaining vegan throughout her recovery. During meetings with the nutritionist, we are usually given ‘homework’, little changes that we, as a family, can do to help our daughter regain a healthy attitude towards food. She regularly cooks her own meals and eats separately from the rest of the family. It’s so much better to be cooking together and having her present at family dinners again. Thanksgiving (and other major holidays) are often peak times of stress for those with eating disorders but this Thanksgiving, we worked and ate together as a whole family again. I started dinner preparation as I always do, by brining our turkey, however, this year our side dishes had a more ‘inclusive’ flavour. 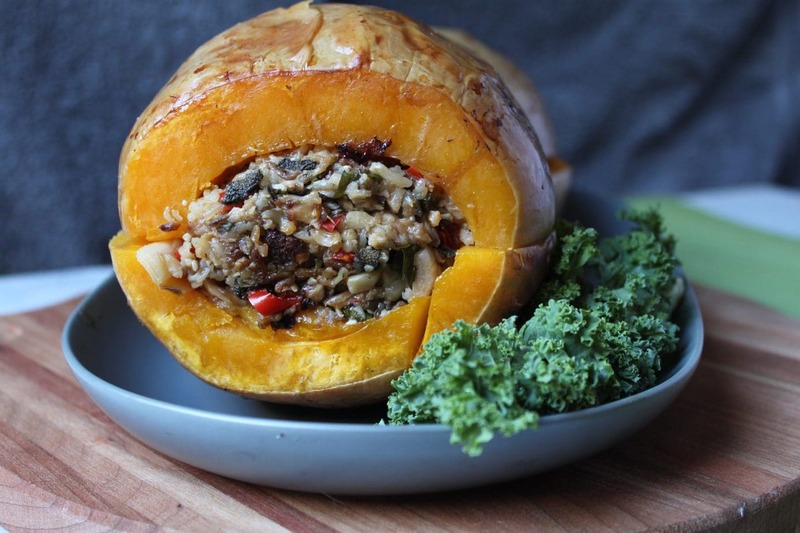 I found a large, quite cylindrical butternut squash and together we stuffed it with a rice and vegetable stuffing. 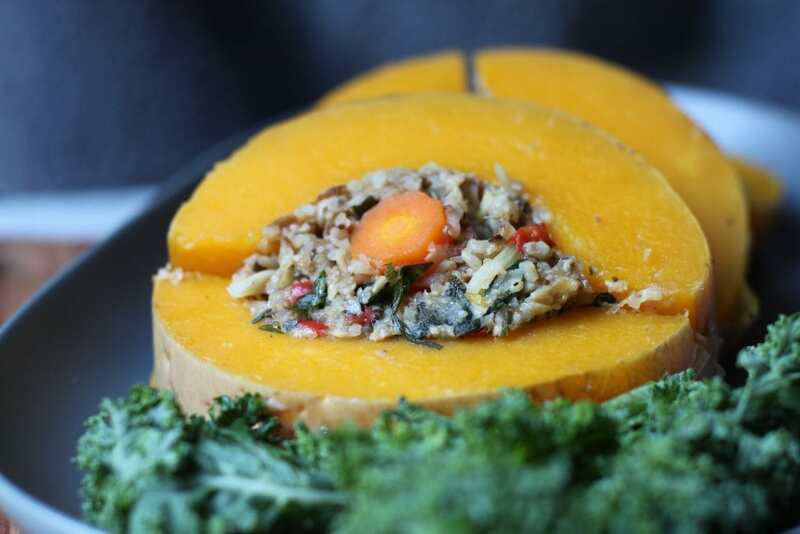 I thought it would be kind of fun to make a vegan version of a ‘turducken’…a ‘veggiedukken’ if you will. When it was done roasting, we sliced it cross-wise and enjoyed our first ever Veggiedukken. As for what made me most thankful of all? While we ate our pumpkin pie and cheesecake, my daughter also enjoyed her very own ‘vegan’ pumpkin pie that she made herself. I’m thankful for little victories. A holiday treat for vegans, vegetarians, and meat eaters alike. 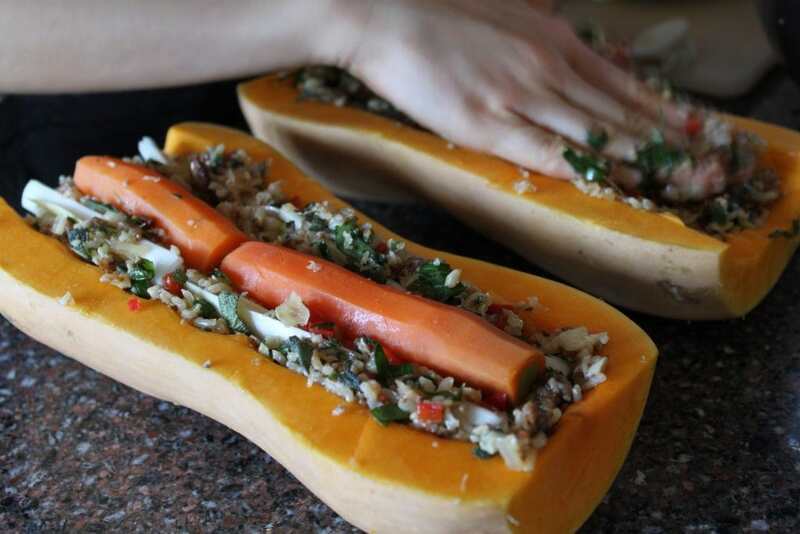 Slice squash in half lengthwise and scoop seeds out. Hollow out the flesh until it becomes only about 1 inch thick, leaving ends intact. Add onion, red pepper, garlic, and mushrooms to a food processor and process until they are a fine dice. 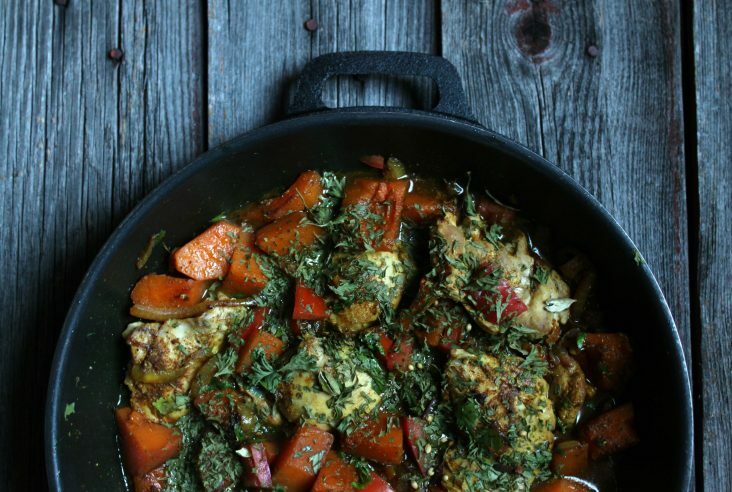 Add olive oil to a pan and sauté vegetables until they become soft. Boil carrot in a small pot for 5-10 minutes until it is slightly softened. In a large bowl, combine vegetables, rice, and bread crumbs. Finely slice the sage (chiffonade) and parsley and add them to the bowl along with the picked thyme leaves. 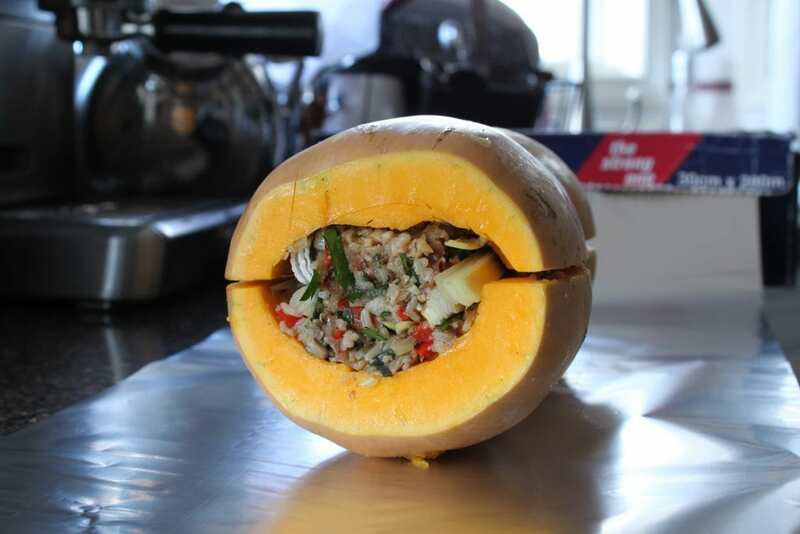 Stuff one half of the squash with mixture, nestle the carrot and lengths of leek along the stuffed cavity. Stuff the other half of the squash and tie with kitchen string. Lightly cover with foil and bake in a roasting pan at 350 F for 1 1/2 hours or until done. Let cool slightly and slice cross wise. Serve. 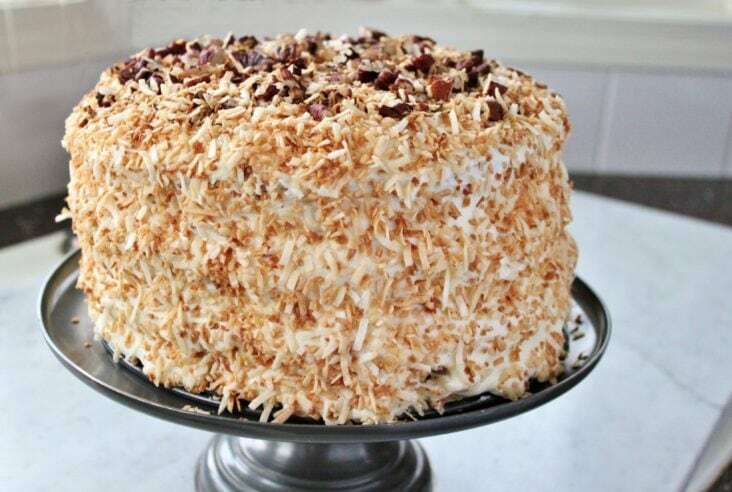 Italian Cream Cake – Dish ‘n’ the Kitchen Turns Two! This is such a neat idea….and it sounds oh so wonderful. All your veggies in 1 serving…awesome!! Yes, though I omitted that I had to get my daughter in law (to be) to cook it in her stove as mine was busy with the turkey. Your Veggiedukken looks delicious! It’s perfect for Thanksgiving and Christmas and I love that you can slice it so it looks great on the plate when serving. There are definitely ups and downs. We went for sushi today and of course she wanted all veggie sushi…but then there was mayo in it. Somedays you can never win. You know what? I am defo going to make something like this! 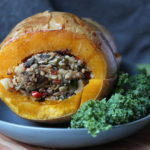 This stuffed squash is right up my street! Such a shame there is no such thing as Thanksgiving in Europe, but I’m still thankful you shared this recipe so I can try it! You can be thankful any day! I love this! And I am so happy that things are getting better. Thank you so much Mimi. It’s a long road…last day of group today. thank you Bridget…I think it just may be a new holiday tradition for our family. What a brilliant idea, Bernice! Bravo for your creativity and ingenuity. I am inspired to try your recipe.